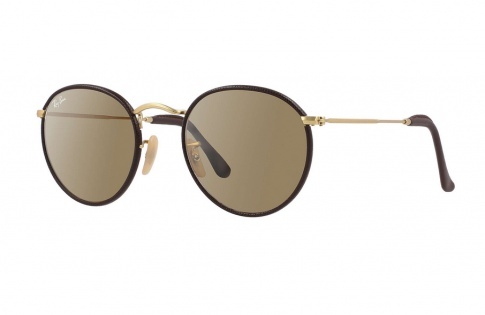 Ray Ban RB 3475Q Round Craft - Brown Leather / Matte Gold Need Help? The RB 3475Q Round sunglasses are part of Ray Ban's Craft Genuine Leather Collection. The collection is a combination of Ray Ban's classic iconic style with an innovative twist. Each pair features premium craftsmanship and is luxuriously detailed with genuine hand-stitched leather around circular crystal lenses and temple ends.